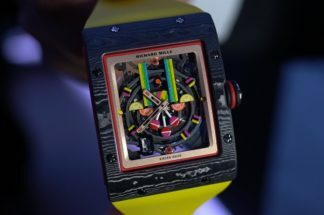 Tuesday 7 August 2018, Sylvester Stallone’s Instagram account saw the informal launch of Richard Mille’s latest timepiece. 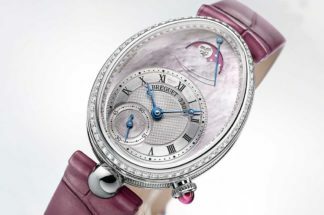 A blurry camera-phone shot of the watch on the actor’s wrist taken at lunch with Monsieur Mille, followed by a close-up of its dial created internet-based commotion and garnered hundreds of thousands of likes. Produced in collaboration with Stallone, the RM 25-01 Tourbillon Adventure is quite the piece. With a gargantuan 50.8 x 23.65mm Carbon TPT and titanium case (water-resistant to 100m) and a manually wound tourbillon movement, it boasts: a chronograph, 24-hour time display, power-reserve indicator, mainspring torque indicator, winding-crown position indicator, interchangeable compass bezels, a compass spirit level and a hermetically sealed compartment for water purification tablets. It is probably best described by Stallone himself, who succinctly appraises it as “a beast” and “the ultimate explorer’s watch” in his Instagram captions. RM cites Stallone’s fictional character John Rambo, alongside its general mandate for watches made to thrive in extreme and hostile conditions (be it Grand Slam tennis, Formula One racing or now, evidently, the jungle), as inspiration for the RM 25-01. Rambo’s influence is most readily found in the fetching camo’ rubber strap, the tablet-compartment and the compass function. Two compass bezels, swapped out and held in place using a bayonet mount, are supplied with the watch. The first, and most conventional, is set against the position of the sun and has cardinal, 24-hour and 360-degree markings. The second has a flip-open hunter-style Carbon TPT cover replete with compass needle, a mirrored interior, viewing slot, graduated marker ring, and anti-reflective, anti-magnetic coated sapphire crystal. For use in conjunction with the hunter-case compass, the spirit level located at 4 o’clock means the user can check the watch is completely horizontal and, thereby, take more accurate readings. 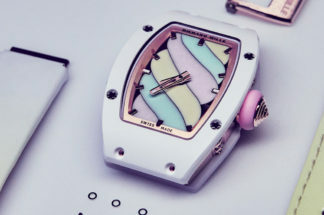 Priced at $983,000, the watch will be made in a limited edition of just 20 examples.